This quote comes from Evan Hunter (Ed McBain), author of King’s Ransom. I’m working on revising Snow, and it’s not easy! I’d rather write a rough draft than edit any day! However, I know editing and revising is something that has to be done, so even though it’s not my favorite, I still try to work on it. Top Writing Day: My top writing day was Friday with 2037 words. What I Worked On: I worked on my Camp NaNoWriMo novel, God Save the Queen. The Good News: I made my word count every day this week! YEAH! The Bad News: I’m going to miss the next few days due to my knee surgery. I’ve been writing ahead to keep my NaNo novel on schedule. Hopefully I don’t fall behind. Lesson Learned: I wrote a bad scene a few days ago and was really down about. The next day I decided to just rewrite it – not delete the old one, but just rewrite a new one after it. Well, it worked out wonderfully, and now I’m back on track. So, my lesson learned is that if I write a bad scene in NaNo, just continue on and write it again. Goal for Next Week: My goal for next week is 1447 words each day (to make up for the days I’m missing). Top Writing Day: My top writing day was Wednesday with 805 words. What I Worked On: I worked on editing Homeland and writing the beginning of the sequel to Snow. The Good News: Apparently I couldn’t let Snow’s world go, because I came up with an idea for a sequel last Friday and have been working on it all week. The Bad News: I didn’t make my goal every day. Top Writing Day: My top writing day was Wednesday with 958 words. What I Worked On: I worked on editing Homeland and writing Hobbit fanfiction. The Good News: I have all my characters named for my upcoming NaNo novel! The Bad News: I didn’t make my goal everyday nor have I been editing as much as I’m supposed to. Lesson Learned: I read a really good article this week about how to pace the “big reveal” in your novel from Go Teen Writers which you can find here: http://goteenwriters.blogspot.com/2014/03/how-to-pace-big-reveal-in-your-novel.html. In my novels I tend to drop a huge bombshell instead of subtle hints along the way. I’m hoping to apply this lesson to my NaNo novel. Goal for Next Week: My goal for next week is 600 words each day again. Top Writing Day: My top writing day was Friday with 1098. What I Worked On: I worked on editing Homeland and writing Hobbit and Star Trek fanfiction. The Good News: I found an editing method that is going pretty well. The first chapter is almost edited! Goal for Next Week: My goal for next week is 600 words again. Monday evening, I checked my email and found a message from NaNoWriMo announcing a webinar called From Rough Draft to Published Novel, hosted by NaNoWriMo, Maureen Johnson, and Lisi Harrison. 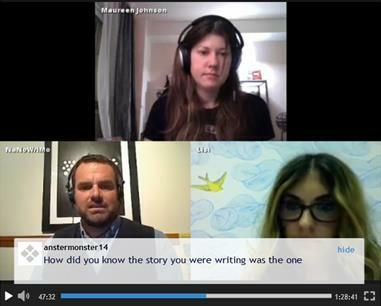 As I’m about embark on my first major edit of a novel, I decided this webinar was just what I needed! I had to sign up! So, 7:50pm Tuesday night, I grabbed my favorite notebook and purple pen and shut the door to my room so there’d be no distractions. At 8:00pm, I sat (virtually) in the chat room waiting with bated breath for the webinar to start. At 8:05pm the webinar tried to begin, but due to some technical difficulties it was another half hour before it officially began. That was ok, though, because Maureen Johnson (who was the only one who could be heard or seen consistently) kept me well entertained ad-libbing a thirty minute comedic monologue. Then she got serious and said, “It is just you and me,” and that the webinar was not real, just a way that she could communicate “a very dangerous mission” she needed me (and any other webinar attendee) to go on. According to her, “You probably won’t make it out alive. But you get free ice cream and all the pencils you can eat.” Needless to say, I accepted the mission, although still unsure of what it was, and I’m now sitting here, chewing on pencils and eating my free ice cream. 😉 Okay, okay, maybe I didn’t get any free ice cream or pencils, but I did have a great time, even if the webinar hadn’t officially started yet. Ms. Harrison eventually joined the fun, answering questions in the chat room instead of talking. After the technical difficulties were worked out, the webinar really got started. It mainly consisted of the two ladies answering chat room questions, read and commented on by Grant, the “NaNoWriMo Guy,” which ranged from “How to deal with plot holes?” to “Recommended books for publishing and writing?” to “What is your agent like?” And wow, was it helpful! I learned a ton about editing, agents, and publishing. I even asked a question that was answered by Ms. Johnson. My question was, “How do you know that the story you were writing was the one?” Ms. Johnson’s answer was that it is “the one you stick with” and that “something seems to come of it, and it seems to grow.” It is “the one you end up working the longest and you keep working on it ’cause you saw a glimmer of something there.” Ms. Johnson also said she likes to test out her story ideas beforehand and that she used to write practice novels when she started writing. Screen print of my question. I was so thrilled to have it read! You can find a recorded version of the webinar here, which means you, too, can find out how to get free ice cream and all the pencils you can eat. Oh, yeah, and how to edit that book you’ve been working on, too. 😉 I definitely recommend watching it!